The new system is as much as 30% more accurate than today's state-of-the-art weather prediction systems used by organizations such as the National Weather Service, according to the National Renewable Energy Laboratory. "It's providing a forecast for solar, wind and other environmental parameters. It learns from solar plants [and] weather stations, and constantly adjusts and improves the forecast," said Hendrik Hamann, Research Manager at the IBM T.J. Watson Research Center. Because the system can better predict how much renewable energy will be available, the nation's power grids are better able to integrate that electricity with traditional forms of power. IBM's new computer algorithm, called Self-Learning Weather Model and Renewable Forecasting Technology (thankfully known as SMT), uses big data analytics and machine learning to improve solar forecasts. The system works by combining more than 1TB of data gleaned daily through more than 1,600 weather-monitoring stations and solar and wind plants in the continental U.S., as well as from weather satellites. IBM also makes solar power monitoring cameras that stare at the sky 24 hours a day to determine weather patterns. 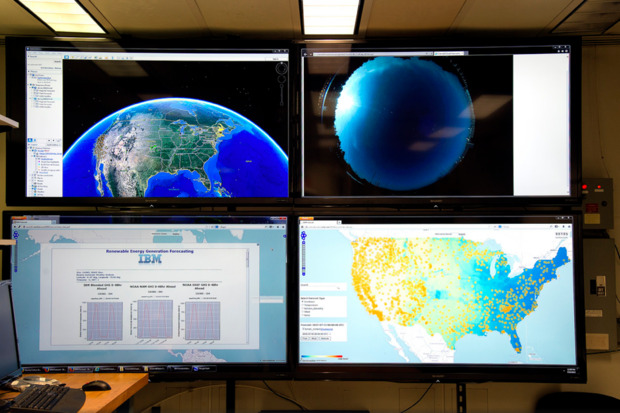 The images are uploaded to IBM's SMT computer algorithm to help model how much solar power will be available in near-real time as well as days or weeks in advance. "The more data you put in, the smarter it gets," said Hamann. 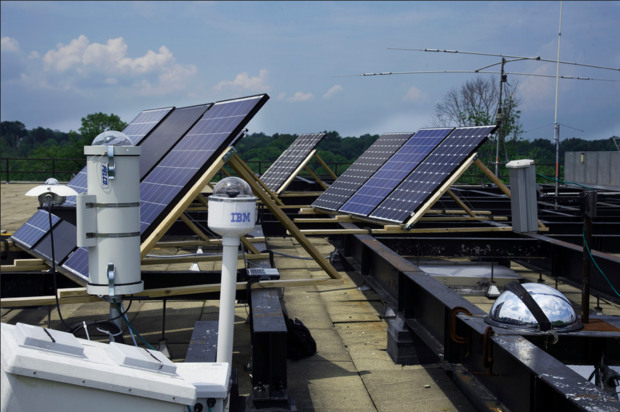 "By continuously training itself using historical records from thousands of weather stations and real time measurements, IBM's system combines predictions from a number of weather models with geographic information and other data to produce the most accurate forecasts -- from minutes to weeks ahead," Siyuan Lu, Physical Analytics Researcher at IBM, said in a statement. Solar power, for example, is predicted to supply as much as 14% of the nation's power in just 15 years and 27% by 2050. Currently, about 65% of U.S. power is derived from fossil fuel-generated power, such as coal, according to the U.S. Energy Information Administration (EIA). As the amount of solar and wind capacity continues to grow, it's critical for regional power grids to know how much renewable electricity they'll have in advance to better plan their capacity needs. Power transmission in the U.S. is controlled by regional independent system operators (ISOs), which receive electricity from member utilities. For example, ISO New England Inc. manages the operation of the region's bulk electric power system and transmission lines. IBM's SMT system takes in new data every 15 minutes, allowing it to predict and then inform ISOs how much energy is likely to be produced from solar and wind farms. "By improving the accuracy of forecasting, utilities can operate more efficiently and profitably," said Bri-Mathias Hodge, who oversees the Transmission and Grid Integration Group at the National Renewable Energy Laboratory (NREL), a collaborator in the SMT project. "That can increase the use of renewable energy sources as a more accepted energy generation option."